The best films are the ones that allow us to fully immerse ourselves in a world that is wholly believable and fully realized. Great films reveal the truth about ourselves. Through a series of news and interview footage we are introduced to the story central to District 9. Scientists, citizens and experts reveal the events that led up to the present. 28 years ago (in an alternative version of our reality) an alien spacecraft planted itself above te city of Johannesberg. People waited and waited for some response, some welcome or threat, but nothing happened. Eventually the military forced its way into the ship to find malnourshed beings, struggling to survive. It is deteremined that the ship is full of slaves or workers, which has been lost from its other fleet. A massive humanitarian effort ensued, giving the aliens food and shelter. As time passed, enthusiasm waned, caring turned into resentment and District 9 (the sequestered area to where the aliens were fenced to live) slowly turned into a slum, replete with violence and crime. Nigerians soon invade the slums to a exploit a black market for weapons and technology. MNU (Multi-National Unitied - a large weapons manufacturer) was called to manage the situation. It is deteremined that the creatures need to be moved from the city to a larger, more remote area. The man charge of the move is Wikus van der Merwe (he is husband to the daughter of MNU's CEO, and the main character of the story). Wikus is a bumbling, compassionate man who has a zeal and enthusiasm for hisjob and a genuine want to help both the "prawns" (the derogitory name given to the creatures, as they resemeble Parktown prawn, a type of cricket found in South Africa) and the people of Johannesburg. Wikus is described as committing an unthinkable act, to which we're (the audience) left to wonder. As we follow the life of Wikus and his efforts to demand the relocation of the prawns, through phony paperwork and military force, we begin to learn a bit about the tenious relationship between human and creature. The creatures have become characiturized as stupid insects; vile, violent and disgusting with an insatiable appetite for cat food — a desire that is used by the Nigerians as a means to gather alien weaponry. Unfortunately for the, and ultimately UMI, the weaponry is useless; without the aide of the creatures. As Wikus scours the slums serving papers and interacting with the prawns, he encounters a highly intelligent alien (unlike the other, blue-collar, redneck like aliens), in a "home" full of technology and a strange vile of a black substance. As Wilkus observes the cannister, a jet of the liquid squirts in his eyes. The events that follow drastically alter Wikus (both literally and metaphorically) and everyone else involved, as his fate and life is inexorably intertwined with the creatures. A massive battle between the lust for technology and power and that of survival and escape develops between MNU, Wikus and the intelligent creature (named Christopher). District 9 takes the viewer on a relentless journey through the effects of selfishness, greed, pride, violence and genocide — the human condition and the moral implications of how one defines value in life and of beings unlike us. The echoes of Aparthed and Nazi concentration Camps are at once obvious, yet subtle. We feel compassion and sorrow for the creatures, as they simply want to survive and escape. We struggle as Wikus foolishly follows the path of self interest, ultimately having to decide on his own life or the lives these foreign creatures. 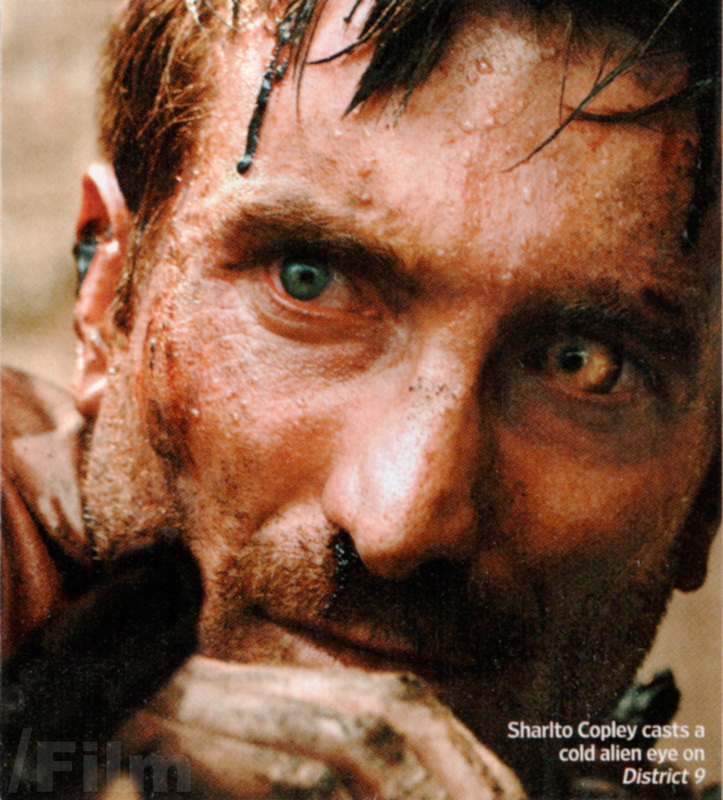 There isn't anything intrinctly original about the story in District 9. Alien invasion. Human cruelty. Redemption. Sacrifice. But somehow District 9 feels new and fresh, heart-wrenching and violent, urgent and timeless, and envelops the audience in a story that is satisifying and poignant. Extreme violence, suspense and language. Comments for "District 9, A Review"
I'm really looking forward to seeing it. I tried to convince Merry to see it, but it has robots and aliens, so it's pretty much a no go for her. Comments are turned off for "District 9, A Review"